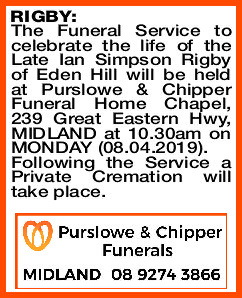 The Funeral Service to celebrate the life of the Late Ian Simpson Rigby of Eden Hill will be held at Purslowe & Chipper Funeral Home Chapel, 239 Great Eastern Hwy, MIDLAND at 10.30am on MONDAY (08.04.2019). 28.8.1944 - 31.3.2019 Passed away after a good fight. Husband to Doris for 54 years. 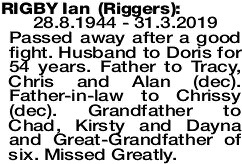 Father to Tracy, Chris and Alan (dec). 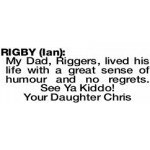 Father-in-law to Chrissy (dec). 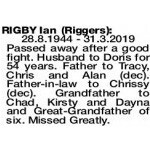 Grandfather to Chad, Kirsty and Dayna and Great-Grandfather of six. Missed Greatly. 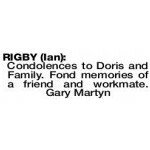 Deepest sympathy to Doris, Tracy, Tony and Chris. 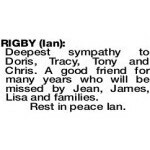 A good friend for many years who will be missed by Jean, James, Lisa and families. 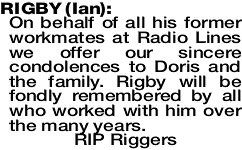 RIGBY IAN On behalf of all his former workmates at Radio Lines we offer our sincere condolences to Doris and the family. 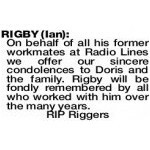 Rigby will be fondly remembered by all who worked with him over the many years.